1. Insta360 made a dedicated page for the Nano (check it out – it’s very polished). The page also showed the parts of the Nano, including a Micro USB port in addition to the Lightning connector. This facilitates transferring files to a desktop. 2. The Insta360 Nano was designed for the iPhone but it may be possible to use it with Android. 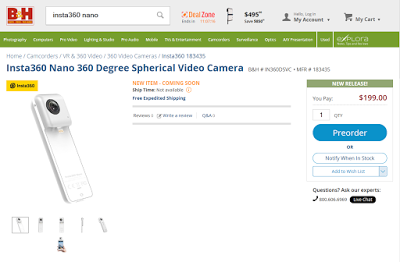 The product page says that the Nano can be connected to “other smartphones” with a transfer cable. This seems to mean that you can use the Nano by itself (without an iPhone) and then transfer the photos or videos from the Nano to your Android or other phone using the Micro USB port. In fact, a micro USB cable is supplied with the package contents. 3. 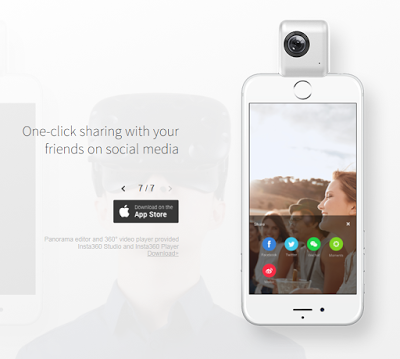 The app will allow sharing to Facebook and Twitter (strangely, no mention of sharing to YouTube). Given that Twitter doesn’t support 360 photos, it probably means you’ll be sharing a cropped version or tiny planet version to Twitter. 4. 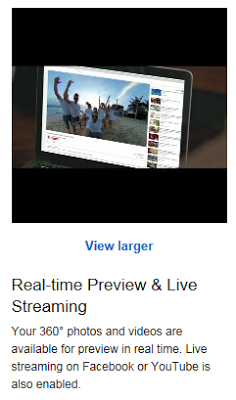 The live streaming capability works with Facebook and YouTube. ​5. The parts list doesn’t include a Micro SD card, so you may need to supply one. It can accommodate up to 64GB. 6. 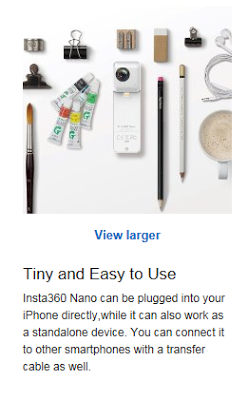 One of the possible holdups for the release is the Insta360 Nano app. As of now, the app is not yet available on the App Store. Apple does take a while to approve apps, so depending on when Insta360 submitted the app to Apple, it is possible the Nano might take longer than expected. On the other hand, if it’s the only holdup and it gets approved sooner than expected, the Nano might ship earlier than July 30. 7. 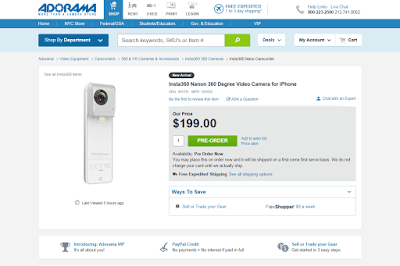 Amazon is the official preorder site for the Nano but the Nano is also available for preorder at Adorama and B&H Photo.